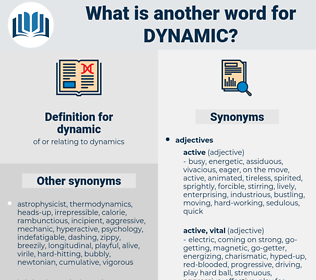 What is another word for dynamic? energetic, dynamically, lively, pro-active, robust, buoyant, strong, evolutionary, forceful, vibrant, thriving, powerful, interactive, ever-changing, action-oriented, resilient, responsive, exciting, vivid, flow-through, flourishing, flexible, enterprising, viable, stimulating, decisive, agile, vigorous, booming, potential, aggressive, healthy. dynamics, dynamically, vibrant, dynamism, aggressive, vitality. vibrancy, impetus, dynamism, vigorous, potential, vitality. fruitless, ineffective, boring, lethargic, weak, inactive, passive, unexciting, impotent, idle, dull, unproductive, lifeless, incapable, apathetic. equivocal, infirm, broken-down, worn-out, weakened, spineless, hesitant, tired, halting, uncompelling, soft, ambiguous, nonassertive, faint, frail, wimpy, invertebrate, unhealthy, understated, unwell, ill, unsound, guarded, wasted, wan, wishy-washy, mild, effete, Nonemphatic, disabled, prostrate, decrepit, feeble, debilitated, nerveless, delicate, unemphatic. The things we call spiritual also are dynamic. In that superlative light he discovered his sin, his error, his need, but he also found the dynamic of the immortal hope. death mask, doting, dionysius, dumas, dinky, dmus, damage, dimness, diminish, dehumanize, dink, demagog, demoniac, dinghy, dominica, deionize, demonize, dominus, demagogy, dimaggio, damascus, dank, deadening, downy chess, donkey, downing, dionysia, deaminize, dominick, demeaning, demagogue, demagogic, Dominicus, diatonic, dunce, demonic, dinge, dingo, damask, dating, dance, dowdiness, danseuse, danish, dengue, dominoes, Dayton Axe, dominic, dominique, doings, dense, dieting, deinonychus, dawning, danaus, dae-han-min-gook, Dayton Ax, demonise, dying, dumuzi, deadness, de-iodinase, donnish, dining, dowding, denounce, dimash, damning, dehumanise, dinka, Den Haag, dynamics, dominance, deimos, dunnock, dong, dung, domingo, dynamise, diatomic, ding, dynamize, damages, dunk, danzig, dinkey, downy ash, downiness, data mining, dingy, dominos, dionysus, dyeing, demise, DMZ.